The Blockly library adds an editor to your app that represents coding concepts as interlocking blocks. Blockly generates simple, syntactically-correct code from the blocks in the editor, which your app can use to run games, control robots, or do anything else your imagination can concieve. 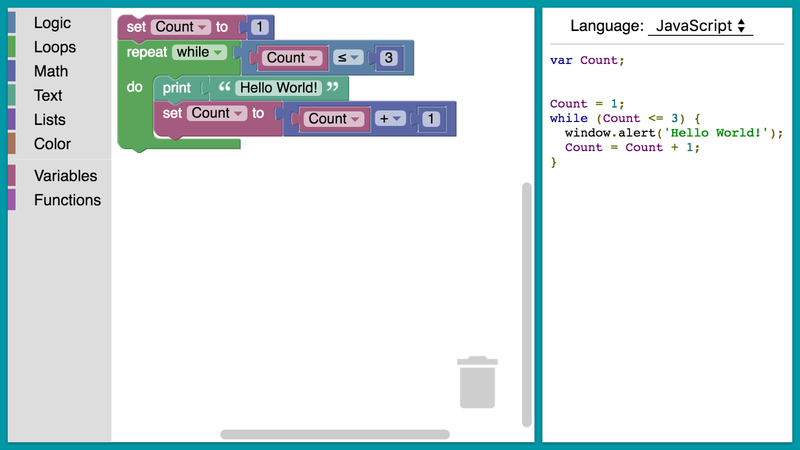 The Blockly library adds an editor to your app that represents coding concepts as interlocking blocks. It outputs syntactically correct code in the programming language of your choice. Custom blocks may be created to connect to your own application. Blockly in a browser allows web pages to include a visual code editor for any of Blockly's five supported programming languages, or your own. In Blockly Games, pictured here, users can solve a maze using Blockly's editor on the right. 100% client side. No server side dependencies. Compatible with all major browsers: Chrome, Firefox, Safari, Opera, and IE. Google and the MIT Media Lab’s Scratch Team are collaborating on the development of a new generation of graphical programming blocks, called Scratch Blocks. Scratch Blocks builds on Google’s Blockly technology and the Scratch team’s expertise in designing creative interfaces for young learners. A collaboration between MIT and Google, built on Blockly. Beginner friendly with an icon based horizontal UI. Scratch's standard vertical UI (in progress). Designed specifically for younger kids.